42 | TH E M R EP O RT O R I G I NAT I O N S E R V I C I N G DATA G O V E R N M E N T S E C O N DA R Y M A R K E T ORIGINATION THE LATEST Credit Applications Decrease, Reflecting Consumers' Credit Fears More consumers report being 'discouraged' by credit prospects than in October. M ore and more U.S. consumers are becoming discour- aged by their access to credit, according to survey released by the Federal Reserve Bank of New York in March. 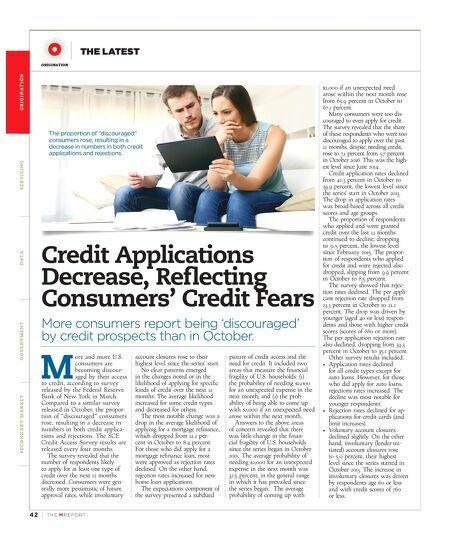 Compared to a similar survey released in October, the propor - tion of "discouraged" consumers rose, resulting in a decrease in numbers in both credit applica- tions and rejections. The SCE Credit Access Survey results are released every four months. The survey revealed that the number of respondents likely to apply for at least one type of credit over the next 12 months decreased. Consumers were gen - erally more pessimistic of future approval rates, while involuntary account closures rose to their highest level since the series' start. No clear patterns emerged in the changes noted or in the likelihood of applying for specific kinds of credit over the next 12 months. The average likelihood increased for some credit types and decreased for others. The most notable change was a drop in the average likelihood of applying for a mortgage refinance, which dropped from 12.2 per - cent in October to 8.4 percent. For those who did apply for a mortgage refinance loan, most were approved as rejection rates declined. 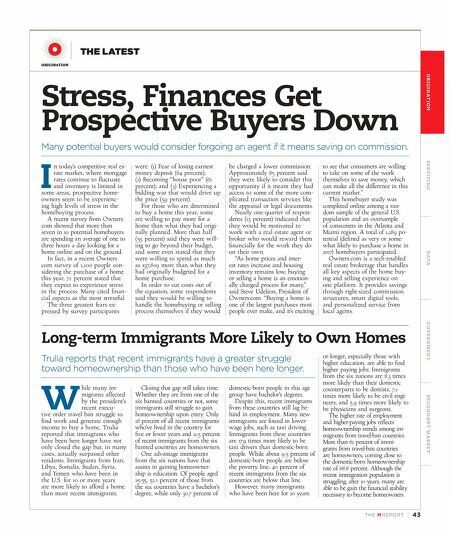 On the other hand, rejection rates increased for new home loan applications. The expectations component of the survey presented a subdued picture of credit access and the need for credit. It included two areas that measure the financial fragility of U.S. households: (1) the probability of needing $2,000 for an unexpected expense in the next month, and (2) the prob - ability of being able to come up with $2,000 if an unexpected need arose within the next month. Answers to the above areas of concern revealed that there was little change in the finan - cial fragility of U.S. households since the series began in October 2015. The average probability of needing $2,000 for an unexpected expense in the next month was 32.5 percent, in the general range in which it has prevailed since the series began. The average probability of coming up with $2,000 if an unexpected need arose within the next month rose from 65.9 percent in October to 67.2 percent. Many consumers were too dis - couraged to even apply for credit. The survey revealed that the share of these respondents who were too discouraged to apply over the past 12 months, despite needing credit, rose to 7.1 percent from 5.7 percent in October 2016. This was the high - est level since June 2014. Credit application rates declined from 42.3 percent in October to 39.9 percent, the lowest level since the series' start in October 2013. The drop in application rates was broad-based across all credit scores and age groups. The proportion of respondents who applied and were granted credit over the last 12 months continued to decline, dropping to 31.5 percent, the lowest level since February 2015. The propor - tion of respondents who applied for credit and were rejected also dropped, slipping from 9.9 percent in October to 8.5 percent. The survey showed that rejec - tion rates declined. The per appli- cant rejection rate dropped from 23.3 percent in October to 21.2 percent. The drop was driven by younger (aged 40 or less) respon - dents and those with higher credit scores (scores of 680 or more). The per application rejection rate also declined, dropping from 39.3 percent in October to 35.1 percent. Other survey results included: • Application rates declined for all credit types except for auto loans. However, for those who did apply for auto loans, rejections rates increased. The decline was most notable for younger respondents. • Rejection rates declined for ap - plications for credit cards (and limit increases). • Voluntary account closures declined slightly. On the other hand, involuntary (lender-ini - tiated) account closures rose to 5.0 percent, their highest level since the series started in October 2013. The increase in involuntary closures was driven by respondents age 60 or less and with credit scores of 760 or less. The proportion of "discouraged" consumers rose, resulting in a decrease in numbers in both credit applications and rejections.